These are all statements made after Cam Newton, who appeared frustrated after the Carolina Panthers’ 24-10 loss to the Denver Broncos and annoyed by reporters pressuring him for sound bites, walked out of his Super Bowl 50 postgame interview. Immediately, a number of people began questioning whether Newton’s behavior was befitting of the “face of the league” and the 2015 MVP. But is the criticism of Newton fair? The reactions to Newton leaving the press conference appear to lie somewhere at the intersection of dehumanization, respectability politics and racial double standards. It’s not secret that we expect athletes to perform for our entertainment without concern for their health, safety or well-being. This is evident when we demand athletes play through injuries, childbirth and death in their family. It’s clear when we require players to remain silent on political and social issues that affect them because we just want to see them play (i.e. the University of Missouri football team protest). And it was clear last night when we insisted Newton perform to our pleasing in a postgame interview, despite being physically, mentally and emotionally drained. We don’t see athletes as humans with emotions, desires, needs and rights. We see them as commodities for our consumption, and the moment we can’t consume them for our entertainment purposes, we become enraged. Why are we not okay with someone walking away from a situation when it is no longer healthy or beneficial to them? What did we expect? For Newton to put his raw, unprocessed emotions on display for public consumption or for him to mask and/or disregard his emotions, an unhealthy practice that’s all too familiar among men. 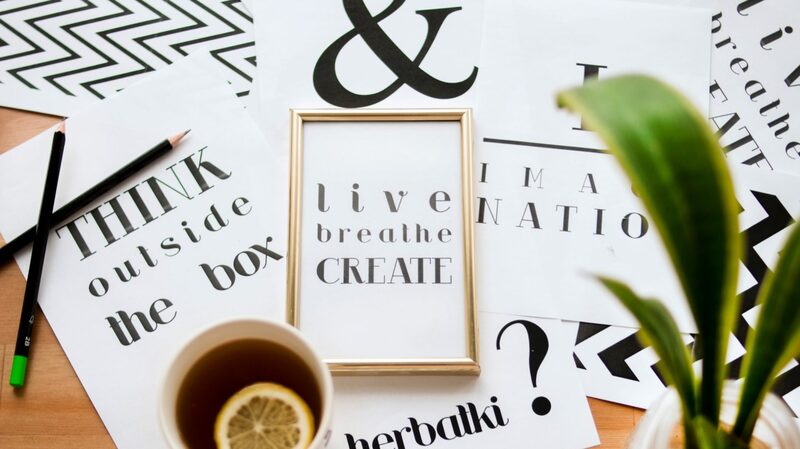 Additionally, marginalized people often police the behavior and social values of those within their group and pressure them to adopt the values of mainstream society instead of challenging mainstream society to accept their differences. Ironically, when mainstream society criticized Newton for dabbing and dancing, Black America surrounded him and forced mainstream society to accept Newton and the dab. We celebrated him for being his authentic self. 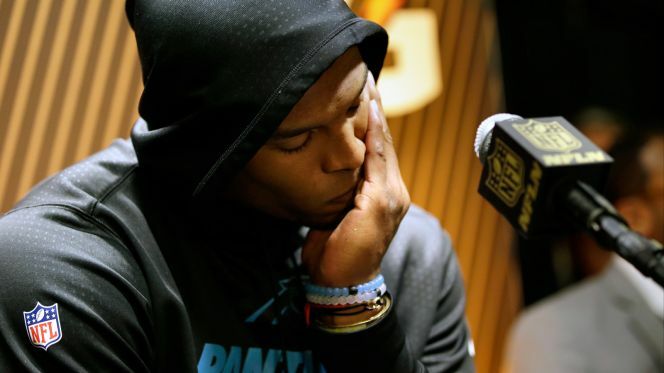 But when Newton chose to stop answering repetitive questions and abruptly, yet politely, ended his interview, all of a sudden his behavior becomes unacceptable?!?! Mainstream society’s values say people should ignore their personal emotions and continue performing; however, Newton chose to walk away for self. More of us should do this. Everyone should be able to understand this. The politics of respectability that the black community forces onto black athletes feeds the racial double standards that are seen too often in the NFL and society at large. 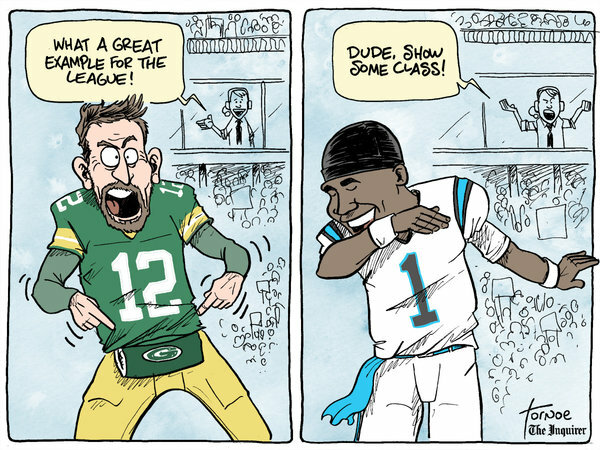 We saw it the week many labeled Newton’s dab unsportsmanlike and offensive to children while Aaron Rodgers’ offbeat pelvic thrusts were embraced. And we do this when “role models” like Tom Brady and Peyton Manning are allowed to invade officials’ personal space while cursing at them but “thugs” like Newton can’t walk away from media questions. When Newton’s white counterparts behave similarly or worse than he does, they simply don’t receive the criticisms that he does, and we have to acknowledge that race is a factor in this. Newton, himself, has conceded that he doesn’t like losing. 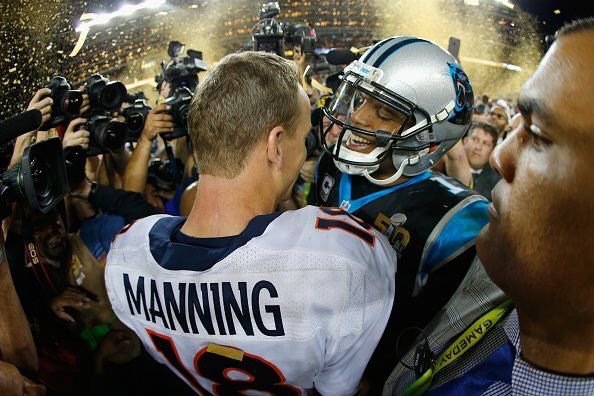 However, people’s anger with Newton isn’t about professionalism or unsportsmanlike behavior. He shook Peyton’s hand with a smile on the field before spending two and a half minutes answering media questions for God’s sake. The vitriolic reaction to Newton ending his interview is really just people’s desperate desire to dehumanize athletes and police black bodies.